This budget safari takes you to Amboseli National Park. Amboseli sits on the lower slopes of mighty Mount Kilimanjaro - Africa’s highest - whose peak lies across the border in Tanzania. Depart in the morning and drive south to Namanga on the Kenya/Tanzania border to arrive in time for lunch. After lunch, enter into the Amboseli National Park with a possibility of seeing game on the way to the campsite. Amboseli sits on the lower slopes of mighty Mount Kilimanjaro - Africa’s highest - whose peak lies across the border in Tanzania. It is quite an experience to see Kilimanjaro hovering above the clouds in an early morning. The animal pictures arising against the dramatic backdrop of the mountain will thrill the photography enthusiast. 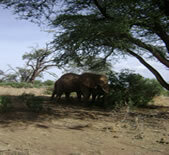 Amboseli National Park is renowned for its huge elephant herds. You will also see buffalo, black rhino, zebra, wildebeest and other plain animals. 0630 hrs - early morning game drive around the park and to the Mt. Kilimanjaro Viewing point. Return to the Camp for late breakfast. After lunch, you will have the afternoon at leisure until 1600 hrs when you go for an afternoon game drive till dusk. This flying package takes you to Maasai Mara, Kenya’s most famous and finest game sanctuary. The Mara offers wildlife in such variety and abundance that it is difficult to believe: over 450 species of animals have been recorded here. You will easily see the Big Five- lion, rhino, buffalo, leopard, and elephant. Not to mention numerous plain animals. It is in the Mara that perhaps the most spectacular event of the natural world takes place. This is the annual migration of millions of wildebeest and zebra from the Serengeti in search of water and pasture. 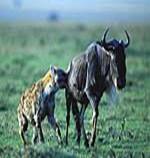 Following on their heels are the predators of the savanna- lion, cheetah, wild dog, jackal, hyena and vultures. The famous Maasai tribesmen live within the dispersal area of the game reserve. Picked from your Nairobi hotel or JomoKenyatta International Airport and transfer to the Wilson Airport. Check In for flight to Maasai Mara is one hour before departure time. Morning flight to Mara is at 1000 hrs & Afternoon flight at 1500 hrs. On arrival Mara, you will be met by your driver guide and transfer to Mara Simba Lodge or similar. After lunch at the lodge, you have an early afternoon free, before going for an afternoon game drive, from 1600 hrs till dusk. The Mara offers wildlife in such variety and abundance that it is difficult to believe: over 450 species of animals have been recorded here. You will easily see lions, rhinos, hippos, crocodiles, giraffe, wildebeests, zebras, buffalo, warthogs, hyenas, jackals, wild dogs, buffalo, leopard, many kinds of antelopes and elephant. It is in the Mara that perhaps the most spectacular event of the natural world takes place. This is the annual migration of millions of wildebeest and zebra from the Serengeti (Tanzania) in search of water and pasture. Following on their heels are the predators of the savanna- lion, cheetah, wild dog, jackal, hyena and vultures. 0630 hrs - early morning game drive in safari vehicle with pop up roof. Return to the lodge for breakfast. Morning game drive for those who wish starts at 1000 hrs till midday. After lunch at the lodge you will have early afternoon at leisure. 1600 hrs - Afternoon game drive till dusk. Take the opportunity to fly over the Mara in a Hot air Balloon provided at an extra cost. The balloon package includes a champagne breakfast in the wild! If you can spare the money, viewing abundant game afloat a balloon is an unforgettable experience. Late breakfast will be provided and later transferr to Airstrip for your flight to Nairobi. On arrival Wilson Airport at 1215 hrs, your driver guide will meet you ready to transfer you to your Nairobi hotel or Jomo Kenyatta International Airport. - Return Flight Nairobi to Maasai Mara Inclusive of taxes. - 2 nights accommodation based on fullboard meal plan. Maasai Mara from Airstrip to your lodge. - Hot air Balloon flight in Maasai Mara – US$ 385 per person extra.